You really should have been here! The mind is the most powerful thing in the world, probably the universe too - but do we believe it is the question?.. But, before this, again we in Jersey would like to say a special thank you to Tim Garner and Pete Nicol for believing in us enough to help bring the UK Grand Prix squash finals here. To the president of Jersey Squash and Racquetball Association Steve Law for doing all he could to assist in the smooth transition of the event; but above all a very big thank you to Pete Byrne & Shane Hollywood, both avid squash enthusiasts and top Partners from one of Jersey's leading international law firms, Bedells - an institution who knows the value of something and not just the price! Both the ladies and men's finals were of the highest order. Both top seeds Laura Massaro (8 on the world rankings) & Daryl Selby (21 on the world rankings) came through in straight sets (3/0). But, as I am sure you will know by now, scores do not always reflect the quality of what we witnessed. The very talented and skilful Laura Massaro never looked like anything other than positive, accurate, sharp and focused; Daryl Selby was exactly the same.. but the irony of it is, neither did the slightly diffident yet very dangerous Alan Clyne (83 on the world rankings) and slightly diffident and also very dangerous Emma Beddoes (36 on the world rankings)! - but for those who need the actual scores Massaro won 11/3, 11/5, 11/4 & Selby 11/9, 11/9, 11/9. See, as both Massaro & Selby have realised, to get to the top it takes more than just hours and hours of training, dedication and positive single-mindedness. It takes more than money can buy or that someone can give you. It take that vital ingredient of 'self belief'. A great man once wrote : "Never worry about the future. You will meet it, if you have to, with the same weapons of reason which today arm you against the present" (Marcus Aurelius 2nd century).. and so I ask you all to repeat after me, daily, : 'I am being with immeasurable powers and I can do ANYTHING I set my mind to'.. say it again, louder!.. again, louder! ..
And so, as the blinds draw down on a very special day for us in Jersey, and the moon hangs in the sky like a blood pearl, you really should come and visit us in sunny and exciting Jersey sometime as we have much much more to offer just squash and racquetball! Finally, on a personal note to Alan Clyne, I would just like to say that here in Jersey the gallery would never have allowed anything un-toward to have taken place, you have my word on that! Life is not measured by the breaths we take but rather it is measured by the moments which take our breath away - where to begin?.. But before this, again we in Jersey would like to say a special thank you to Andrew Nickeas, who made time to cross the water to be here to compere the event. In doing so he put flesh on the bones of what we witnessed, joined the dots so to speak, making the players real to the audience - all I can tell you is the players seemed at home with him, comfortable, relaxed and easy, giving us the best of themselves on and off the court - well done that man you're a legend! First up was Emma Beddoes and Becky Botwright. This proved to be a fascinating battle which went the full distance and kept us on the edge of our seats. Beddoes eventually won 12/10 in the fifth with some lovely touches and twiddle boasts but more on her tomorrow in the final. However, one could not help but feel that Botwright could surely have won this match. Her lobs in the first game were inch perfect and only got better. Her half court boasts were as good as you will see anywhere and with amazing accuracy! .. sadly she lost 10/12, 13/11, 8/11, 11/7, 12/10 but very very well played that woman! You can be sure you will be seeing much more of her in the coming years. Laura Massaro won very comfortably in the other ladies semi final beating Kim Hay 11/5, 11/5, 11/4. However, Hay did have moments of brilliance and her crisp backhand shone bright but Massaro was too strong to let that trouble her. Personally, I would like to see Hay play again but against someone not so strong as she had the hallmarks of real talent in the making and some truly inspiring strokes..
Simon, Simon, Simon Parke, what a guy! 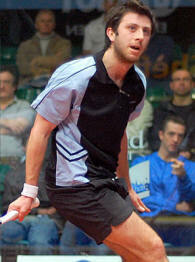 His opponent Alan Clyne won 3/1 in what seemed like an age with a match worthy of any squash fan's dvd collection! 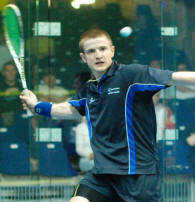 After losing the first game 11/2 Parke settled down, grew strong and treated us to some amazing, truly amazing squash. Parke narrowly lost the second game 12/10 after a thrilling and nail biting half an hour of gruelling squash. He then found much needed energy reserves from somewhere and mesmerised us to a much deserved 13/11 win in the third. Although the skill and racket control of Clyne over came Parke to win 11/9 in the fourth, a fifth game might have been very interesting indeed!.. More on Clyne in tomorrow's final.. The second men's semi final saw Daryl Selby and Andy Whipp finish the audience off with their sheer pace, agility, touch and control - absolutely fantastic squash! .. Selby won 3-1 with scores 11/4, 7/11, 11/0, 11/4 and afterward said that "Andy ran out of legs as he has not played much of late due to his recent back problems" .. more from Selby in tomorrow's final but a huge thumbs up for Andy Whipp if you will. Finally, if anyone out there is thinking of staging an event with these guys and gals, be warned! - you will need a painter on hand as your courts will need a new paint job by the time they have finished with it, possibly new plaster too! - breath taking or what!? Stay tuned to sunny and exciting Jersey where things are not over just yet! 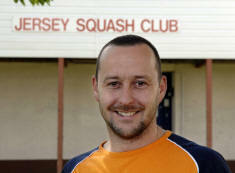 As Jersey welcomed its first UK Grand Prix squash finals, the event got off to a flying start.. 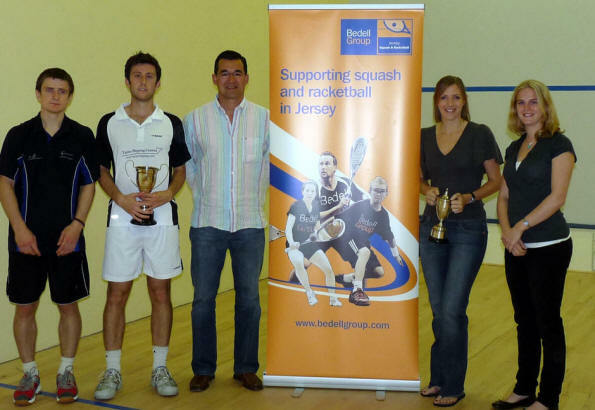 But before this, we in Jersey would like to pay a special tribute to both Nick and Sarah Taylor for what they have done for our island, and the tireless efforts to promote Squash & Racketball on it to all age groups. In truth, what these two people have achieved in a little over a year is nothing short of miraculous and we salute you! - You are indeed a credit to the game and sport in general. 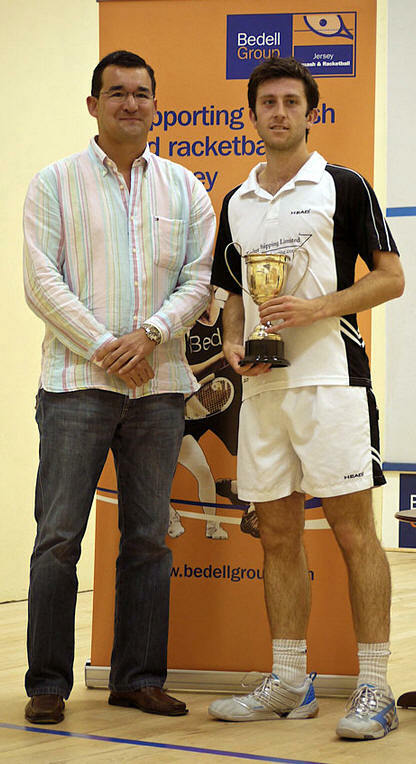 Daryl Selby took on Stuart Crawford in one of the first matches, and after some excellent and long drawn out rallies, Selby won the first game 11/6. Selby looked strong and confident as he covered the court efficiently but Crawford held his own and at 4/4 Crawford looked to have found his stride and pulled away to a 7/4 lead. However, this was short lived and Selby levelled the game to 8/8 inside 15 minutes after some skilful squash, long rallies with some fine attacking and retrieving from both players. 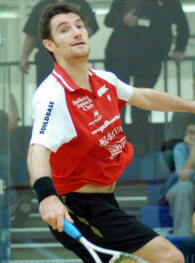 Selby always looked to be the man to watch as he marched on to a 2/0 lead winning the second game 11/8. Since being capped and playing his first England match recently, Selby started the third game sharp and with purpose quickly gaining a 3/0 lead. Despite the sparks of genius from Crawford, coupled to gut wrenching rallies which would make the average club player dizzy, Selby stepped up his game winning 11/7. The 3/0 score did not do justice to the match - well played Stuart! In the second of the matches, the ex-world number 3, 1999 US Open Champion and now 39 year old Simon Parke took on the smiling and youthful talents of Steve Meads. The opening volleys were blistering the ball nearly changed colour! A cigarette paper was all that would fit between the wall and the ball, if at all, from some of the best squash of the evening. What can only be described as two warriors of the game battling it out; the crowd were more than entertained and educated to what it takes to be one of the top players of the game! Meads knew he had a serious match on his hands but he still managed to stop and smile at one of the toddlers eating crisps "cheese and onion he asked with his understanding smile?".. but what a display from the squash arsenal of shots we were treated too! Again this scoreline does not reflect the match and Meads should be very proud of his defensive and counter attacking play from the barrage of blows dealt him by Parke. Older but definitely wiser; older but mentally stronger; older but definitely Parke is one to watch out for at anytime. Parke came through to win in straight games. In the other matches Alan Clyne beat Peter Billson 3/0 and Andy Whipp beat Joel Hinds in a thrilling five-game match. Tomorrow the men’s semi-finals get underway, and the women are in action with the world number 8 Laura Massaro and Emma Beddoes favourites to reach the final. Stay tuned to sunny and excited Jersey where things are hotting up! The BSPA/Beddell Group UK Grand Prix Finals will land on the beautiful island of Jersey in early September boasting a world class field in both men’s & women’s events. Taking place from 3rd-5th September it is the season finale for the UK Grand Prix with the winners of the individual events qualifying for the play-offs. 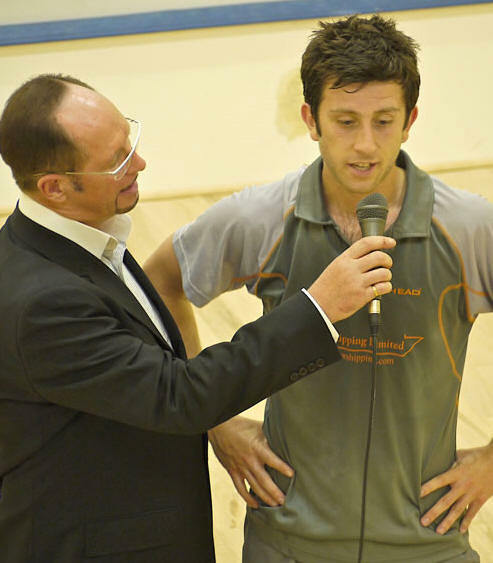 Headlining the men’s draw is World no.25 and upwardly mobile Daryl Selby, who comes into the event in great form having just beaten World no.9 Adrian Grant in the BSPA Elite Series last week. 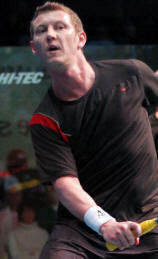 He will, however, face stiff opposition from Scottish no.1 Alan Clyne & Manchester’s mercurial Andy Whipp. Also looking to get their names on the coveted trophy are former World no.4 Simon Parke & former World no.11 Stephen Meads, but they face the toughest of routes having been drawn to play one another on the opening night. Firm favourite for the Women’s title will be World no.8 Laura Massaro, the defending champion. Massaro will be seeded to play World no. Emma Beddoes the final. Beddoes, like Selby, will be looking to do the double having won the UK Grand Prix standings, but she opens her account against the women who finished second in the table, Becky Botwright, so won’t have it all her own way. This is the first time the finals have been staged outside the mainland and are certain to be a stunning success. Nick Taylor and his team are sure to put on a stunning event, and it will be great to bring world class squash to Jersey as they look to build on the good work that has been put in there at grass roots level. 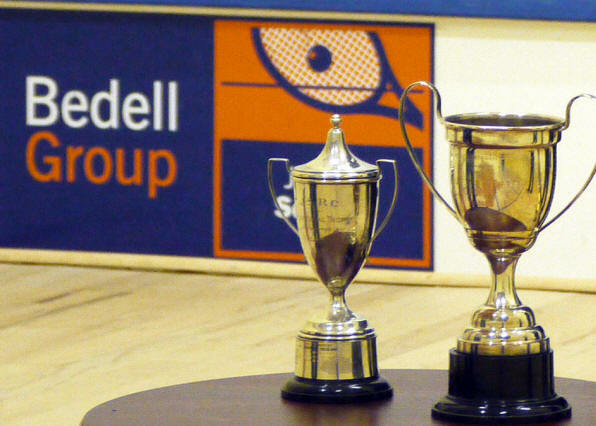 The British Squash Professionals Association is delighted to announce that this year’s end of season PeterNicolSquash.com UK Grand Prix Finals will take place in Jersey from 3rd-5th September. The Grand Prix Finals, co-sponsored by racket brand Prince, have will round off an exciting season that saw Daryl Selby & Emma Beddoes finish top of the standings. However, they will face some stiff competition in the Finals with Selby seeded second behind new World no.7 Peter Barker and Beddoes actually taking up a spot as the lowest seed behind England internationals Laura Lengthorn-Massaro, Tania Bailey & Vicky Botwright! Bailey will be hoping to hit the ground running after an operation this summer, while the men’s event will have a British feel with Scottish numbers one and two, Alan Clyne & Stuart Crawford, looking to make an impact on England’s recent European champions. 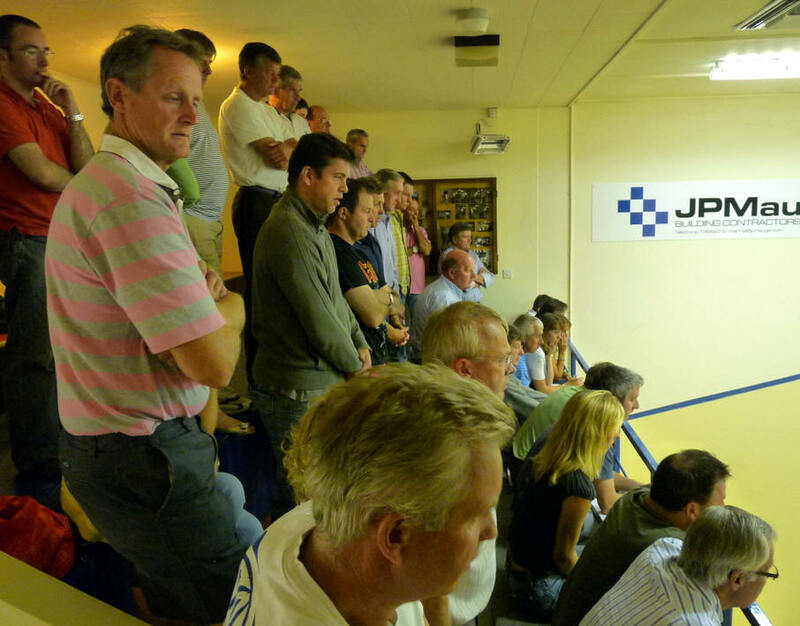 The move to Jersey comes after three successful years at Ipswich Sports Club and promises to be an exciting new era for the event.